We spent a few hours in the food court, Fun City, and doing the tango while my friend took her own sweet time doing some shopping for her kids [yes, i am not really a shopping person :-)] And then came the twist in tale. I mentioned "hey, do you what this Pix 5D cinema is? Seen it anywhere in Mumbai maybe ? [they used to live there earlier]" ..
And that was that.... i was dragged, well not really but convinced very sweetly that she was going to spoil me [she spoils me enough as it is] and we were going to experience 5D today! Saw a long queue outside and almost decided against it when a man in a Black Tee shirt[ Mr Rajesh] came towards us and explained the concept..
And a show could fit in about 32 people. Ting Ting Ting... 6.45 and the door opened and we were the 1st lot to enter the hall. Based on the mini tip received from one of the earlier viewers, we grabbed seats in the 1st row, and put on our seat belts & 3D glasses. Psst. guess what?-- The seats at the theatre are 3 DOF, Drgree of Freedom, witch allows up and down, front anf back, left and right movement in sync with the onscreen activity. It also has wide variety of environmental effects including, smoke, fog, bubbles, thunder, storm, wind, rain, snow etc. If you have a heart condition or prone to headaches/migraine, stay away..
Dont say i dint warn you~! On the 3rd wing of the Express Avenue Mall. .................. i hummed as i got ready to attend the Musical night at Chennai's Rooftop Film Fest [RTFF]. The highlight of this event is that we watch movies through the night, about 4movies, from 9.30pm to 6.30am... And inbetween movies, there is a brief discussion on the movie played, audience talking about various aspects that caught their attention, dint appeal, ideas, thoughts, and so on. Cosmo Brown: What's the first thing an actor learns? "The show must go on!' Come rain, come shine, come snow, come sleet, the show MUST go on! 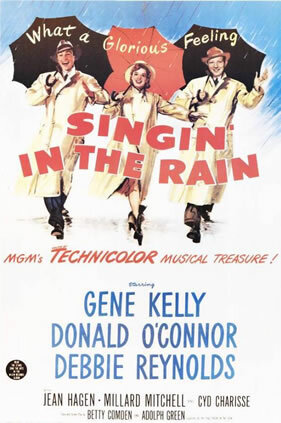 Watching Singin' in the Rain was such an exhilarating, exuberant, almost magical experience. The 102 minutes went by in a whiz, with scenes flowing seamlessly, laughter, excitement, romance, emotions in the right blend. The story revolves around the Hollywood movie industry. Don Lockwood (Gene Kelly) and Lina Lamont ( Jean Hagen) are a popular duo of the silent movie industry. So much so that Lina assumed Don is in love with her and going to pop the big question soon. Don barely tolerates the shallowness of Lina, grits his teeth because the audiences seem to love seeing them together. One day, in an attempt to escape the screaming fans, Don out into the road and hops on a car, bus into a passing car, driven by Cathy Selden (Debbie Reynolds). Along the short ride, there are quite a few heated words exchanged between them, where Cathy shares her opinion of the so called movie industry and what real acting is all about. She drops him off and heads away. But fate has other plans, when Don makes an entry to the party being hosted by R F Simpson, head of the studio he finds Cathy popping out of a cake and doing a small performance with another group of dancers. Attracted and curious, he begins his hunt to find Cathy with the help of his childhood/best friend Cosmo Brown (Donald O'Connor) . At the party, R F introduces the group to what a talking movie is all about and how the 1st talking picture- 1927's The Jazz Singer was being made. R F decides that movies being made here forth will have dialogues and dubbing. The director convinces Don and Lina to learn dialogues, go for voice modulation and shoot the movie with dialogues/dubbing. The only problem they face is Lina's grating voice. The scene where the director gets Lina to talk into a mike is howlarious. He is totally exasperated. A preview is held when the entire team watches the movie fall apart in front of their eyes. There is a scene where Don repeats the line "I love you" to Lina over and over, the audience breaks into mocking laughter. A twist occurs when in the middle of the film, the sound goes out of synchronization, with hilarious results, but alas the audience walks out labeling the movie as the worst ever.. It is during this moment that Cosmo chances upon Cathy at another studio nearby . RF then signs her on as a cast in the movie being made with Lina and Don, but she ends up becoming the voice over for Lina (the entire dubbing being done in secret, without Lina's knowledge). They persuade R.F. to turn The Dueling Cavalier into a musical called The Dancing Cavalier, re-shooting couple of scenes with song and dance sequences, and releasing the same to the world. Getting whif of Don's budding love towards Cathy, Lina takes matters into her hands, and threatens RF to not cast Cathy, but keep her as a dub artist only. She threatens to sue him, RF and the guys agree to go along but come up with an ingenious plan that breaks Lina's ploy. In between the scenes, the sprinkles of music and dance is what keeps the story engaging and entertaining. Initially when RF shuts down the shoot as he no longer wants to make a no talking movie, Cosmo's Make them laugh performance is awesome, amazing... Another number, "Moses Supposes," during the voice modulation is such a display of the talent possessed by the actors. The beautiful melodious Good morning by Cosmo, Don and Cathy is another masterpiece... This is a movie that is a must watch for movie lovers.... Put aside the movies of today and go enjoy this!